A new house is an exciting time in anyone’s life, and a housewarming arrangement is a great way to say “congratulations.” Giving that special someone such a housewarming gift is a great way to celebrate their new home and let them know that you care. 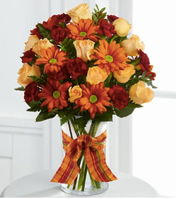 We just love the FTD Color Your Day Paint Can flower arrangement line. This new line features vibrant and colorful flower arrangements in paint can vases. This is the perfect congratulatory expression for a new home, especially if your loved one has been hard at work repainting their new home! The collection features 4 arrangements, each in a different color theme. Color Your Day with Happiness – this pink-themed bouquet features fuchsia roses, pink gerbera daisies, lavender daisies, red matsumoto asters, bupleurum and beautiful greens, all displayed in a sweet pink paint can vase. Great for the daughter who just moved into a dorm or her first apartment! Color Your Day with Sunshine – this yellow-themed bouquet features yellow roses, white spray roses, yellow cushion poms, white traditional daisies, white monte casino asters and gorgeous greens, seated in a sunny yellow paint can vase. Perfect for a friend! Color Your Day with Beauty – this purple-themed bouquet offers a dazzling display of lavender roses, fuchsia carnations, purple double lisianthus, white Asiatic lilies, bupleurum and vibrant greens. These are arranged in a lovely purple paint can inspired vase and would be lovely for the couple who moved to a new house to create a new nursery. 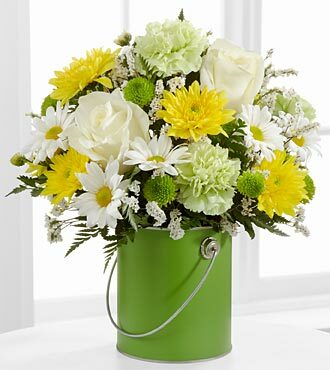 Color Your Day with Joy – is a cheerful green-themed bouquet with green carnations, white roses, yellow cushion poms, white daisies, green button poms, white limonium and beautiful greens in a green paint can inspired vase. This would also make a great gift for someone who just moved into a new office! These paint can vase floral arrangements are so much fun, they are sure to delight the recipient, and brighten their new home!